So, as a follow up to my ACDC lesson, here is the extended version of the backing track from that solo. I’ve kept the track fairly simple, with just one rhythm guitar, and it’s all in the key of E minor. As I said, this is all safely in the key of E minor. We’re using powerchords the whole way though (so not ‘major’ or ‘minor’ chords), but the root notes spell out the E minor pentatonic scale. Basically, what I mean is the track contains the chords: E5, G5, A5, B5 (and there is a D5 for half a beat). If you take out the ‘5’ part of each chord, these are actually the notes of the E minor pentatonic scale– so that would be the first choice here. So, yeah…I called this one a ‘Backing Black’, get it? Huh? As I said, you’ll probably want to stick mostly to the E minor pentatonic scale for this track. 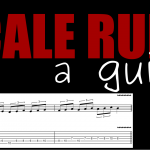 If you’re feeling really adventurous, you might even try the E blues scale! Of course, the E natural minor scale will also fit perfectly fine- any scale that has the notes of the chords above (remember, forget the ‘5’, it’s just a thickener for the chord). However, I wouldn’t recommend something like the Phrygian mode here. Even though the notes would technically fit the track, I’m not sure the sound would go well. Try it if you like. You could also break the track up into two, 8 bar sections. This would give you only E5, D5 and A5 for the first part. Over this you could possibly use even more scales because you’re less restricted by potential chord clashes (just because there are less chords…). 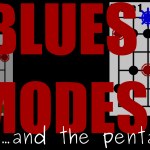 This includes the major scale and major pentatonic, although I would more likely try the Dorian or Mixolydian modes, because they are a bit ‘bluesier’. 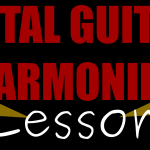 Just be aware that using anything other than the pentatonic or blues scale will mean you wont sound like ACDC! So, unless you want to sound really weird, you’re fairly limited on your choice of scales for this one. The question is: how do you create interest? Well, there are actually a lot of things you can do here, but you have to use a bit more imagination than just changing the scale! Creating something rhythmically interesting, or being melodic are the things that’ll make a good solo here. 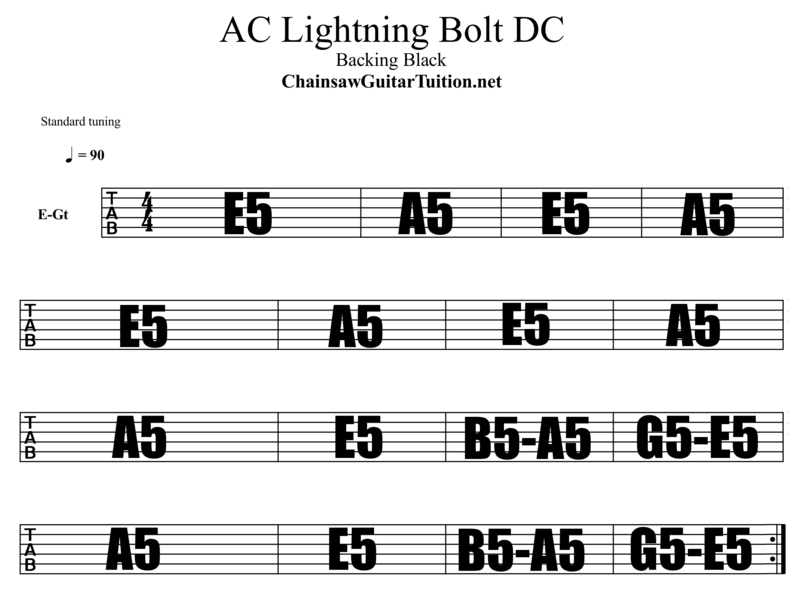 The drum pattern to every ACDC song is pretty much the same, so is the key and the scale (most of the time). Yes, you may argue that this makes them a bit samey and boring, but then how do you explain their huge success? 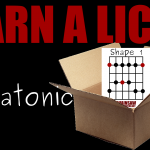 Essentially, to play to this track, you’re going to have to learn to ROCK without fancy scales, sweep picking or any other advanced techniques. Now, that’s something that takes skill! Disclaimer: I’m not saying that using more technically advanced techniques isn’t impressive, or doesn’t take skill! It’s just that those skills are less overlooked in guitar circles. Playing something good with less is a skill in itself! I talk about using phrasing and other melodic techniques in my ebook ‘Awesome Lead Guitar 1’. 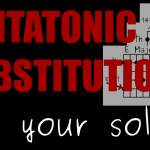 In the book you’ll learn the basics of soloing- from the pentatonic scale, to how to start improvising. Essentially, I’ll teach you everything I’ve mentioned here, but in more depth. The book also includes 17 full solos, with their backing tracks for you to jam along to. Check it out now!